Simple sautéed fava beans are a lovely, super spring-y side dish. I find that they are particularly delicious alongside chicken or egg dishes, but don't feel limited by my tastes. Look for fava beans with plump pods that have just started to turn shiny—you want that sweet spot between super-young favas with beans so tiny it will take forever to prep them, and older pods with beans that have started to turn a tad starchy. As always when making fava beans, one must ask oneself: Is it really worth the hassle of double-shelling them? Why go to all this trouble of shelling the beans out of the fat pods, briefly boiling the beans, and then removing the shell of each individual fava bean? Well, those shells tend to have a bitter, tannic edge and removing them reveals a remarkably sweet and nutty (not to mention bright green!) bean inside. In the case of this recipe, where the sweet tenderness is of the essence and the unique flavor of the shelled fava beans really shines through, I think it's worth the prep work. Remove the fava beans from their pods (there's usually a stringier side to each pod, and you can "zip" them open by pulling off that string). Bring a medium pot of water to a boil, add enough salt to make it taste as salty as the sea. Blanch the beans for about 1 minute. 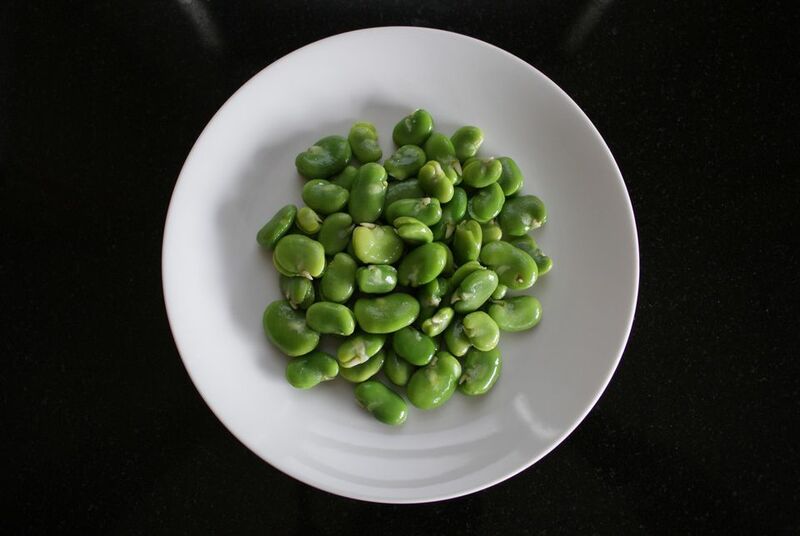 Drain the fava beans and rinse with cold water to cool them off until they're cool enough to handle. Then remove the shell from each bean. In a large frying pan over medium heat, melt the butter. Add the fava beans and cook, stirring frequently, until the favas are tender (about 3 minutes). Add salt and pepper to taste. Garnish with the fresh herbs if you like, and serve immediately. Make ahead tip: These are ideal to make ahead, and they don't suffer too much. You can most certainly do all the shelling up to a day ahead and store the double-shelled fava beans, covered and chilled, until you're ready to sauté them.